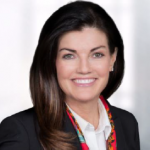 Maureen MacInnis, Senior Vice President, Chief Human Resources Officer and Communications at Dentsply Sirona, has been recognized for her leadership and commitment to the development and advancement of women leaders. She was honored on November 14, 2018 at Linkage’s Women in Leadership Institute held in Phoenix, Arizona. Linkage, Inc., a global leadership development company, honored Maureen MacInnis on Wednesday, November 14, at a special awards ceremony during its 2018 Women in Leadership Institute held in Phoenix, Arizona. MacInnis was one of four award recipients who were honored. The Executive Impact Award recognizes leaders who have demonstrated a deep commitment to advancing women leaders and have accelerated the growth of women in their organization and community. A six-member jury selected MacInnis, Senior Vice President, Chief Human Resources and Communications at Dentsply Sirona, for one of this year’s awards. MacInnis leads a global team of approximately 310 Human Resources and Communications professionals and is a member of the company’s Executive Team. Dentsply Sirona employees nominated MacInnis for the award in recognition for her efforts to advance women and her commitment to promoting diversity across the organization. MacInnis established Dentsply Sirona’s Women Inspired Network (WIN), a platform for women leaders at Dentsply Sirona to support the acceleration of their career development by building key leadership competencies and developing stronger networks. Now in its fourth year, the current cohort includes 27 participants, who join the more than 75 who are already part of the Network. Linkage hosted a panel with the four award recipients. On a stage in front of more than 900 female executives from Fortune 1000 companies, nonprofits and global government agencies around the world, the honorees shared insights into how their personal experiences shaped their careers.